Tiny Troopers Joint Ops by Wired Productions is a war game which puts you in control of a troop of bobble-head soldiers as they fight their way across a series of mini-maps. Imagine a Wii version of Call of Duty with niggling undertones of strategy reminiscent of classics like Worms and Hogs of War, and you’re almost there. A brief tutorial is available to the twin-stick arcade style of combat of moving with the left analog stick and spraying bullets with the right stick. It is a simple but intuitive system of fast-paced combat that works well – winning in battles relies on you using both sticks simultaneously to dodge bullets and shoot accurately at enemy targets. The main menu presents the option of two campaigns: soldier campaign and spec ops campaign. 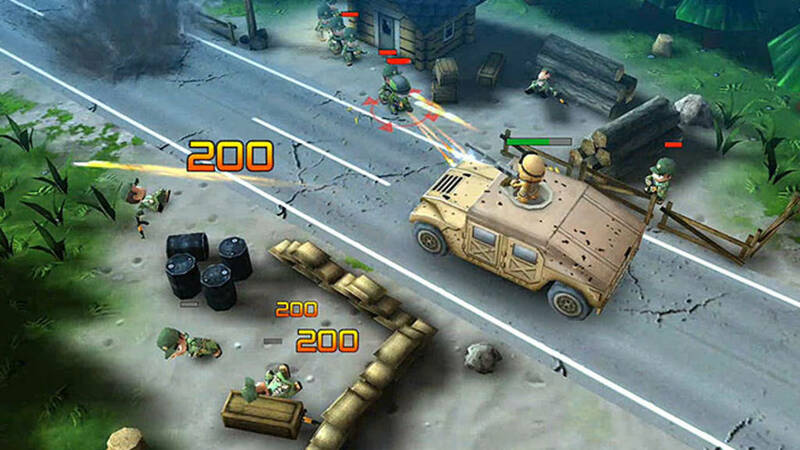 As you might expect from a cartoon war game, the overall plot of both is to defeat the enemy. Short clips of cartoon-like narration of impending nuclear doom are just enough filler to set this up without overcomplicating a nicely simple premise. Like cheese on toast, some things are best left basic. The point-and-shoot plot has a variety of mission objectives that can include protecting journalists, surviving, destroying tanks and buildings, and eliminating enemy infantry. A few levels in, the maps get bigger and secondary missions are introduced, and these mix-up combinations keep the levels from becoming repetitive or too easy. As well the missions, and the get-to-the-end-of-the-level dash typical of arcade games, Tiny Troopers makes effective use of its simple system of collectables. There are a variety of things scattered around the mini maps: dog tags, speed boosters, weapons, health packs and medals. Each collectable has a different strategic value. Medals can be used to revive your troopers – worth doing as if you don’t, the replacements start as the lowest rank. Grenades and rockets are the only real way to defeat tanks, outposts and buildings. Winning battles against buildings and infantry earns you points that can be spent on air drops of reinforcements, weapons, health – or on the pretty expensive upgrades to equipment and unlocking specialist troops. The collectables are just sparse enough to make them worth actually collecting, which gives Tiny Troopers Joint Ops an element of strategy that makes it more than just an arcade game that you can play with your eyeballs glazed over while you do your shopping on another screen. It makes it interesting. I’ll say niggling rather than challenging. But yes: fun. The game has cross buy and cross save options, meaning you can pick up your game and play on Ps3, Vita or PS4. My only disappointment in Tiny Troopers was the lack of ‘Joint’ in the Ops. As well as in the title, there is the promise of the online with the leaderboards for the Zombie mini-games, but there is no multiplayer option and in my opinion, Tiny Troopers misses a trick here. These days, we expect multiplayer – especially in a shooter – and there is definitely the space for a two-player team-play or competitive-play. A team-play option could only have made it better and would have stretched out the game lifespan, and added another layer of fun potential.